I have a new vision for the the plant of the week. Instead of the detailed entry about the biology, etc, of the plant of the week, I am going write about why a particular plant is special to me. 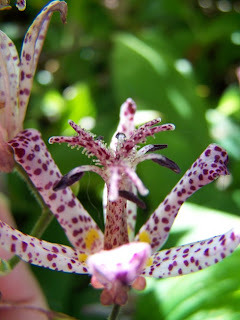 The plant this week is the Toad Lily (Tricyrtis hirta), in the Lily family (Liliaceae). This plant is not native to the United States, but is sold as a garden plant. The picture below was taken at the Missouri Botanical Gardens. The toad lily was one of the first plants I bought to grow in the flowerbed of our house in Springfield. I loved the spottiness of the flower, and the beautiful arrangement of the flowers on the stem. It actually bloomed once before we moved. The people who live there now have taken out that flowerbed, which makes me sad. Those are some of my favorites, too. They did okay in my garden in Virginia, where I had a few, but I don't think they would like it very much out here in uber dry Utah, would they? We have a plant of the week in botany class and this past week it was the cherries blooming at Brooklyn Botanic Gardens and the ruined orange crop in California-- both allegedly signs of global climate change, and both examples of two giant genera of fruit trees.